Happy Wednesday! How is your week going? My week has been going pretty good so far! Today I am excited to share with you a book on a subject that I'm learning more about; Detoxifying my body, with a cleaner eating lifestyle. For me, the word diet does not mean cutting calories, or any other fad eating meal plans, that promise you will lose weight if you eat more protein, or eating less carbs, and I'll be honest, the idea of eating only fruits, vegetables, soups and salads all day does not appeal to me either.It's funny that I received this book, and my brother in law was looking for more information on detoxifying. I'm only slightly skeptical on the whole idea of clean eating for as little as three days. I did try Dr. Oz's 3 day Detox and I did feel better it's just that going to school for my Nutrition's degree, I lean more to eating a well balanced diet, cutting out all the chemicals out of the food we eat, eating less sugar, and I'm so happy to see that Organic food is not only becoming readily available, but I've noticed it's not as expensive to eat organic as it used to be, as more people become aware of GMOs and are creating a demand for eating a healthier lifestyle. Everyday Detox: 100 Easy Recipes to Remove Toxins, Promote Gut Health, and Lose Weight Naturally ! 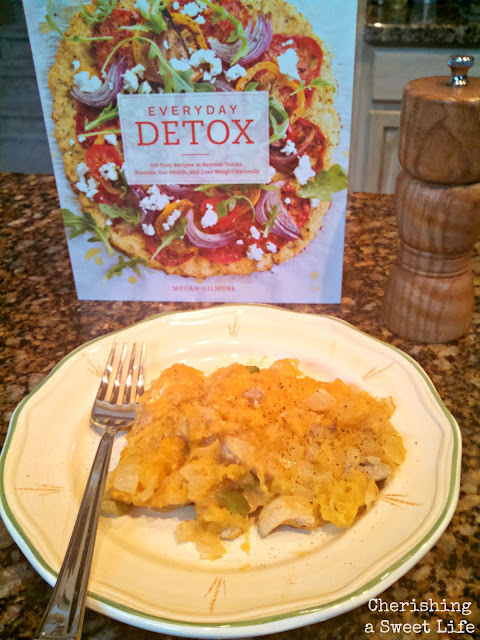 Here's what I liked about Everyday Detox; even though this book is written with a focus on clean eating, it also gives the options for the recipes to substitute, omitting or adding certain items to make them Gluten Free, Vegan, Dairy Free, Nut Free, Soy Free, or Omnivore friendly by adding a high quality meat to a dish. The core of this book, is based on my belief as well, that Megan Gilmore points out, "Short term cleanses and detox programs are just another form of procrastination allowing you to avoid the real task at hand~ making lasting life style changes!" There is a 7-Day Detox menu to jumpstart your detox, full of fresh fruits, vegetables and salad, one day for dinner is a Maple and Mustard Grilled Salmon, personally, I'd be adding more high quality proteins and Gluten Free recipes to the menu. There are some delicious sounding recipes on the Detox menu, like Banana Coconut muffins, Go-To Greek Salad, and Dark Chocolate pudding. Megan also suggests for those with a sweet tooth, that it is ok to indulge in a few pieces of Dark Chocolate with at least 70% cacao. What I liked best is Megan Gilmore, makes it easy to understand and how to customize each meal, with fruits, non- starchy vegetables, starches, proteins, including nuts, seeds and dried fruit, as well as neutral items, picking one item, except non-starchy vegetables which you would use to fill the rest of your plate. It is very general, but easy to follow, especially when I really don't like cauliflower, or walnuts, what type of high quality meats to use and starches are good for me and my digestion. Simple, easy and quick recipes to follow. No complicated steps or ingredients I don't know the names of. Most ingredients I already had on hand. The photographs are bright, clean and although they are minimalistic, almost rustic and earthy looking, they are very beautiful pictures, that are easy to look at. I love that you can customize your approach to detoxifying, without having to follow a set plan. One of the recipes in the book reminded me of a comfort food, I would love when my mother made it , was spaghetti squash. She'd always top it with butter, brown sugar and cinnamon. Here I added, jalepenos, goat cheese and cheddar cheese. The jalepenos really gave the squash a kick and the goat cheese calmed it down. My family loved it, and some of you may know, that both my son and husband are Type 1 Diabetics, and some of you may know of someone that is too. In all the years, I'd known that squash is very good for you, I had no idea, just how good. For my son and husband, they pay attention to the amount of carbs, and it's really hard because I am addicted to pasta and fresh baked breads, I could eat them at every meal and every day, when I found out that 2 cups of spaghetti squash has the same amount of carbohydrates that a slice of bread has, I was thrilled. It's easily digested and helps managing their diabetes so much easier. 2. Melt the butter in a 10-in skillet, over medium heat. Add the onion and jalapenos and sauté until soft and the onion becomes translucent, about 8-10 minutes. 3. In a large bowl, mix together the chevre, yogurt, and salt. Add the sautéed onion and jalapeno and stir well. Using the times of a fork, scrape the cooked spaghetti squash flesh, and cooked chicken into the bowl and stir well to mix. 4. Transfer the mixture to a 3 1/2 quart casserole dish and top with the Cheddar cheese until the edges are golden 35-40 minutes. Serve warm. Looking for more delicious and healthy recipes, Megan also blogs and Detoxinista, and has posted some Labor Day recipes. I received a complimentary review copy of this book from Blogging for Books in exchange for my honest review.